ToBeFree awarded T85372: Add support for per-category editnotices a Like token. MGChecker awarded T156646: Make a config object for each extension/skin, deprecate GlobalVarConfig and RequestContext::getConfig() a Love token. RandomDSdevel awarded T111663: Tag AWB edits a Like token. Liuxinyu970226 awarded T111663: Tag AWB edits a Like token. RandomDSdevel awarded T73236: Automatically tag edits that make a redirect, or convert a redirected page to a normal page, or move a page across namespaces, etc. a Haypence token. MusikAnimal awarded T73236: Automatically tag edits that make a redirect, or convert a redirected page to a normal page, or move a page across namespaces, etc. a Like token. Liuxinyu970226 awarded T91535: Performance issues with tags a Like token. Liuxinyu970226 awarded T73236: Automatically tag edits that make a redirect, or convert a redirected page to a normal page, or move a page across namespaces, etc. a Like token. Liuxinyu970226 awarded T150593: Make it possible for ORES to defer changes for review a Hungry Hippo token. Liuxinyu970226 awarded T118696: Allow to defer 'suspicious' edits for review on any page in a reviewable namespace ("Deferred changes") a Like token. eranroz awarded T91535: Performance issues with tags a Like token. awight awarded T118696: Allow to defer 'suspicious' edits for review on any page in a reviewable namespace ("Deferred changes") a Party Time token. awight awarded T150593: Make it possible for ORES to defer changes for review a Hungry Hippo token. JJMC89 awarded T111663: Tag AWB edits a Like token. TerraCodes awarded T119241: Allow autoconfirmed users to report edits to oversighters a Like token. Jack_who_built_the_house awarded T85372: Add support for per-category editnotices a Like token. TerraCodes awarded T118696: Allow to defer 'suspicious' edits for review on any page in a reviewable namespace ("Deferred changes") a Like token. Cenarium added a comment to T125329: Save references in page_props and cache. Cenarium added a comment to T127787: Strip markers in references data. Cenarium added a comment to T157658: Factor out a backend from EditPage. I've made an attempt to refactor EditPage in https://gerrit.wikimedia.org/r/#/c/338276/. This goes a bit beyond factoring out a backend as I've also rewritten the UI part based on an MVC pattern. Cenarium updated the task description for T158359: Replace EditPage to decouple saving logic from edit processing and user interface. Cenarium merged T158359: Replace EditPage to decouple saving logic from edit processing and user interface into T157658: Factor out a backend from EditPage. Cenarium merged task T158359: Replace EditPage to decouple saving logic from edit processing and user interface into T157658: Factor out a backend from EditPage. Cenarium added a comment to T158359: Replace EditPage to decouple saving logic from edit processing and user interface. Cenarium added a comment to T157715: Selective patrol: an AI-based system to prioritize patrolling of edits. Various ORES filters that will enable users to find the edits that are most in need of review. User-defined highlighting as an alternative to or in addition to filtering, so users can decide which edit properties they want to spotlight. This sounds promising, though I'd still like a way to integrate other sources than ORES, such as AbuseFilter and bots. Cenarium updated the task description for T157715: Selective patrol: an AI-based system to prioritize patrolling of edits. Cenarium added a comment to T156083: Consider how to best inform anonymous users that their edit has been actively deferred. There are several points in the process where knowing that your edit is pending review seems relevant. Ideally it would be great to be able to tell editors of issues on their edits as the users makes them, or as soon as they try to save. Of course we can customize the notice as needed. It's based on the notice shown when editing pages under pending changes, message key "revreview-edited". I've added a warning about that, see image below. I've put it at the bottom to avoid being too obtrusive to experienced IPs and in light yellow from the color palette to differentiate it from other notifications. Cenarium created T158359: Replace EditPage to decouple saving logic from edit processing and user interface. Krinkle awarded T98617: Make page moves patrollable a Orange Medal token. Cenarium updated the task description for T157882: Separate file patrol from regular patrol on the English Wikipedia. Cenarium added a project to T157882: Separate file patrol from regular patrol on the English Wikipedia: MediaWiki-Patrolling. Cenarium created T157882: Separate file patrol from regular patrol on the English Wikipedia. Cenarium added a comment to T157826: Spam blacklist should provide options like the Title blacklist. Hm yeah, but the special page would be hard to implement compared to just adding some options. Cenarium updated the task description for T157826: Spam blacklist should provide options like the Title blacklist. Cenarium added a project to T157826: Spam blacklist should provide options like the Title blacklist: Stewards-and-global-tools. Cenarium created T157826: Spam blacklist should provide options like the Title blacklist. Cenarium added a comment to T14363: Moved pages should be listed in NewPages/RecentChanges with current title, namespace, existence etc..
Not just moves accross namespaces are an issue, see this recent discussion. I think we need something like Special:NewMoves and move patrol (T98617). Cenarium removed a parent task for T70930: Store the page_id of the redirect page in log_params when a page is moved without suppressing the redirect: T70311: Add mirrormove module to MirrorTools. Cenarium removed a subtask for T70311: Add mirrormove module to MirrorTools: T70930: Store the page_id of the redirect page in log_params when a page is moved without suppressing the redirect. Cenarium removed a parent task for T71047: Develop countermeasures to the merge page histories attack: T70311: Add mirrormove module to MirrorTools. Cenarium removed a subtask for T70311: Add mirrormove module to MirrorTools: T71047: Develop countermeasures to the merge page histories attack. Cenarium edited projects for T62084: Implement all features required for creating Inclupedia, added: MediaWiki-extensions-MirrorTools; removed Goal, MediaWiki-Database. Cenarium closed T71855: Special:RecentChanges should have a "Hide mirrored changes" option as Declined. Inclumedia seems to be dead, and the project's initiator is globally locked. As such I am closing this task. If however, someone still finds a convincing use for it, feel free to reopen it. Cenarium closed T71234: If data retrieval from the remote wiki fails, try again only after the data has been made available as Declined. Cenarium closed T71234: If data retrieval from the remote wiki fails, try again only after the data has been made available, a subtask of T62093: [MirrorTools] Implement capability for mirroring all revisions that occur on the remote wiki by accepting revisions pushed from a bot, as Declined. Cenarium closed T70206: Write a script to pull log events from a remote wiki as Declined. Cenarium added a comment to T70206: Write a script to pull log events from a remote wiki. Cenarium closed T72055: LocalWiki users should not be allowed to make changes to remotely live pages, other than deleting revisions as Declined. Inclumedia seem to be dead, and the project's initiator is globally locked. As such I am closing this task. If however, someone still finds a convincing use for it, feel free to reopen it. Cenarium closed T72055: LocalWiki users should not be allowed to make changes to remotely live pages, other than deleting revisions, a subtask of T62084: Implement all features required for creating Inclupedia, as Declined. Cenarium removed a subtask for T61618: [MirrorTools] Should mirror all revisions and log actions that occur on the remote wiki: T70936: rc_this_oldid should contain the revision IDs of null revisions created by log events. Cenarium removed a parent task for T70936: rc_this_oldid should contain the revision IDs of null revisions created by log events: T61618: [MirrorTools] Should mirror all revisions and log actions that occur on the remote wiki. Cenarium closed T66490: [MirrorTools] Implement capability for mirroring user creation and user renaming events submitted to the API by MirrorPushBot, a subtask of T61618: [MirrorTools] Should mirror all revisions and log actions that occur on the remote wiki, as Declined. Cenarium closed T66490: [MirrorTools] Implement capability for mirroring user creation and user renaming events submitted to the API by MirrorPushBot as Declined. Mirror tools / inclumedia seem to be dead, and the project's initiator is globally locked. As such I am closing this task. If however, someone still find a convincing use for it, feel free to reopen it. Cenarium closed T62096: [MirrorTools] Implement capability for mirroring all imports that occur on the remote wiki, a subtask of T61618: [MirrorTools] Should mirror all revisions and log actions that occur on the remote wiki, as Declined. Cenarium closed T62096: [MirrorTools] Implement capability for mirroring all imports that occur on the remote wiki as Declined. Cenarium closed T61618: [MirrorTools] Should mirror all revisions and log actions that occur on the remote wiki, a subtask of T62084: Implement all features required for creating Inclupedia, as Declined. Cenarium closed T61618: [MirrorTools] Should mirror all revisions and log actions that occur on the remote wiki as Declined. Cenarium closed T127852: Publish of recent change for a log entry should be deferred as Resolved. Cenarium updated the task description for T157747: ?action=info incorrectly states that a new page is indexed when not. Cenarium added a comment to T91535: Performance issues with tags. Looks like this is broken since January 31, see here. Cenarium raised the priority of T91535: Performance issues with tags from Normal to High. I tried to load Special:Tags at Wikidata. After waiting almost 25 minutes, this is what I got: 504 Gateway Time-out nginx/1.11.6. Cenarium created T157747: ?action=info incorrectly states that a new page is indexed when not. Cenarium updated subscribers of T157715: Selective patrol: an AI-based system to prioritize patrolling of edits. Cenarium created T157715: Selective patrol: an AI-based system to prioritize patrolling of edits. Cenarium closed T89553: Recent changes patrolling limited to tagged changes as Resolved. I think we absolutely need a form of patrol intermediary between NPP and RCP. But tags can't be the solution, though they may be part of the solution. We should check if an edit is worth being shown as needing patrol from a variety of sources, including: problem tags (as this task suggested) , but also ORES and AbuseFilter, and bots via the API. Problem is how do we store this data? It would be nice for the patrol flag to have three states: -1 for "needs patrol", 0 for "not patrolled", +1 for "patrolled". Unfortunately, rc_patrolled is unsigned in the rc table, so we would need a schema change. I'll make a task for selective patrol in a short while. Cenarium triaged T133442: Auto-accept pending revision when user self-reverts to reviewed version as Normal priority. Low if this were only that, but I've addressed some related issues in the patch set, the code needed some refactoring. Cenarium triaged T157659: Prefilled autosummary when editing old revisions as Lowest priority. Cenarium created T157659: Prefilled autosummary when editing old revisions. Cenarium triaged T157524: Make autosummary for multiple revision undos as Lowest priority. Cenarium added a comment to T157524: Make autosummary for multiple revision undos. @Aklapper Ok, thanks for the heads-up. I'm not sure yet if I'll rewrite the task description or simply make a patch myself. Cenarium added a project to T157524: Make autosummary for multiple revision undos: MediaWiki-Page-editing. Cenarium renamed T157402: Provide a reliable way to pass information between hook handlers, "hooked" objects from Provide a way for passing information between hook handlers to Provide a reliable way to pass information between hook handlers, "hooked" objects. Cenarium added a comment to T152434: Add method to Revision to check if it was a Revert, and whether an edit was Reverted. A Revert object is a good idea, I think I'll implement this in a new version of https://gerrit.wikimedia.org/r/#/c/329651/. This should be kept separate from the Revision object though, a revision shouldn't be aware of the Revert object, a Revision object is standalone and shouldn't depend on the page history (revisions can be moved around for instance). So I don't think we should have a method on Revision to indicate if it's a revert, but the goals underlying this task can be accomplished without. Cenarium created T157524: Make autosummary for multiple revision undos. Cenarium created T157402: Provide a reliable way to pass information between hook handlers, "hooked" objects. Cenarium added a comment to T157395: Page Curation tool one source in stead of self-published. I've done the edit, thanks for checking the tags. Cenarium added a comment to T12331: Introduce page creation log. This would be helpful for contributions, we don't have any built-in way to check non-redirect page creations by a user. I'm not saying this would replace a log, but this would be easier to implement. I could easily add a page creation tag as part of https://gerrit.wikimedia.org/r/#/c/194458/ (for T73236). Cenarium updated subscribers of T156646: Make a config object for each extension/skin, deprecate GlobalVarConfig and RequestContext::getConfig(). Cenarium added a comment to T17702: Allow manual override to the auto-confirmation system. Isn't this resolved by the confirmed usergroup? Cenarium added a comment to T156877: Create a config object for each extension/skin during registration. They both would make it unnecessary for extensions to set ConfigRegistry, but T155154 suggests a GlobalVarConfig object while this one suggests a new LocalConfig object (see https://gerrit.wikimedia.org/r/#/c/335383/5/includes/config/LocalConfig.php) that would be based only on the extension's own settings and handle merging with local settings. Eventually, this aims to deprecate GlobalVarConfig, and do the same thing for core (achieving a separation of configs and the removal of configuration globals). Cenarium added a comment to T142663: ExtensionRegistry does not allow complete override of config variables e.g. flat arrays. I've done this in https://gerrit.wikimedia.org/r/#/c/335383/ as part of T156877. Cenarium created T156877: Create a config object for each extension/skin during registration. Cenarium updated the task description for T156810: Finish deprecation of RequestContext::getStats(). Cenarium created T156810: Finish deprecation of RequestContext::getStats(). Cenarium added a comment to T156448: Remove flaggedrevs-protect-review (PC2) page protection option from the English Wikipedia. Cenarium created T156646: Make a config object for each extension/skin, deprecate GlobalVarConfig and RequestContext::getConfig(). It takes several minutes to load Special:Tags at wikidata, the way we're retrieving hitcounts is not efficient or sustainable. It's also a concern for the dropdown (T27909) on cache misses. My suggestion, implemented in the above patch set, is to create a table holding tag hitcounts, updated when adding/removing tags. Cenarium added a subtask for T58828: Provide access to Notifications for anonymous users: T136428: Add primary key to echo_notification table. Cenarium added a parent task for T136428: Add primary key to echo_notification table: T58828: Provide access to Notifications for anonymous users. Cenarium added a comment to T68450: Set $wgTitleBlacklistLogHits = true on WMF wikis. I've looked into this and the titleblacklist log entry will only appear at the wiki where the user created the account, not on the central loginwiki. It certainly would be appreciable to have a centralized log of titleblacklist hits (same for spamblacklist) but it doesn't look easy to accomplish. Regarding the feasibility of anon notifications (T58828), I had made a rough patch that didn't alter the db and was mostly OK for the purpose of deferred changes, so it can be done without hassle. 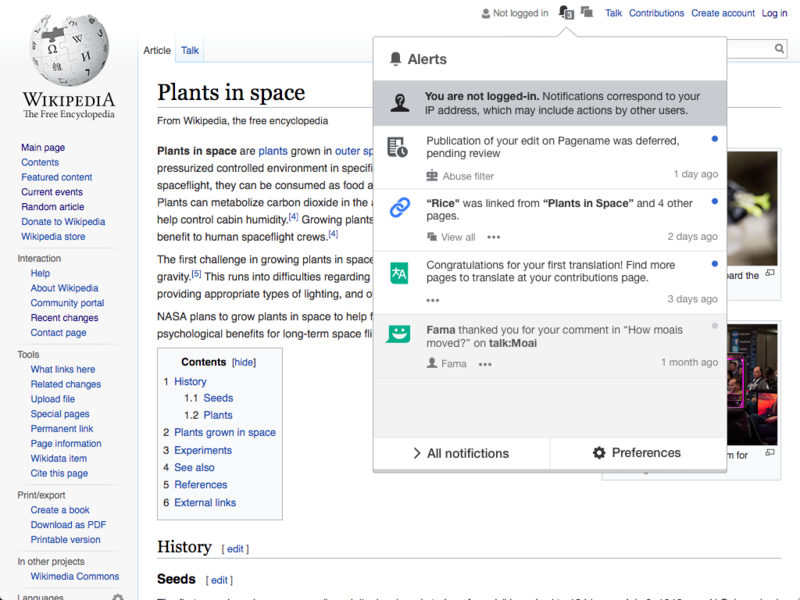 But we might as well provide full support for anon notifications while we're at it; the implementation is relatively straightforward, I've updated the patch (https://gerrit.wikimedia.org/r/#/c/329374). We just need to make sure that the changes in the db schema are OK.
Cenarium added a comment to T58828: Provide access to Notifications for anonymous users. Assuming we can alter the db, I've modified the patch set to offer the same level of functionality than notifications for logged in users. 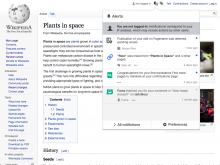 They can be marked read / unread and filtered by titles, and cross wiki notifications are possible. The last one requires caching the IP address in a global key. E.g., Deferred Changes applies to new and anonymous users only. Would it be possible to delay Save of these users only so that the Deferred Changes analysis can be part of the Save function for them? I think this is just a social convention currently (though we could change that). Edit filters could be used to defer anyone, I think. It is not possible to defer edits authored by users who have the 'review' right (which there are few of: admins and designated reviewers), but AIUI that's the only limitation. Users with the 'autoreview' right (which there are many of: all non-new users) presumably would not have their edits deferred upon save, but how that works exactly isn't clear to me. Edits are immediately autoreviewed in the NewRevisionFromEditComplete handler, while abuse filter deferrals are run in a deferred update, so the deferral always occurs after the autoreview, thus these users would still be deferred. I don't know CentralAuth enough to answer. Cenarium updated subscribers of T58828: Provide access to Notifications for anonymous users. At first I only wanted this to cover the deferred changes case, but we might as well build a full fledged system. I think the cache would be enough in the vast majority of cases for the IP to get the notification. And having an archive of notifications for IPs is IMO not essential, but sure if we can, it would be preferable overall to use the db. My only concern is whether we can do so, as I was under the impression that some tables are too sensitive to be altered in some ways. Hi Cenarium. Our messages crossed paths. As you can see on T58828, this task was created precisely so that we can consider whether Notifications are in the only or best way to deal with IP users impacted by Deferred Changes. The project of extending Notifications to IP users is more complex than might at first meet the eye. It's not something we want to wade into without considering alternatives. I don't see any alternative, we need an asynchronous system, we can't delay the save for performance reasons,. I don't mind delaying deferred changes implementation until we get anon notifications in place personally, which IMO is a must have for various reasons. I don't think we should build a system just for deferred changes when a general one exists.